Three social outings have now been announced for 2019. The full details and arrangements for booking can be found under the 2019 Events web page. Please click this link: 2019 Events. In brief there is a spring trip on 29th May to Port Merrion, North Wales with 2-course lunch, coach and guided tour (£36); a summer trip on 15th August to Southport Flower Show, their 90th Anniversary, called ‘The Garden Party’ (£25 which includes coach and entry); and an autumn trip away (4 days, 3 nights) from 15th September to Belfast including Titanic Experience, Giant Causeway and guided tours and coach. Out via Scotland, back via Wales all for £390. Bookings and payment for all trips by cheque (to Salford U3A) to Ken or Janet Ball. Port Merrion trip payment by 15th March (monthly meeting); Southport trip payment by 21st June (monthly meeting); Belfast trip deposit of £50 by 15th February, plus there is a single supplement of £105. 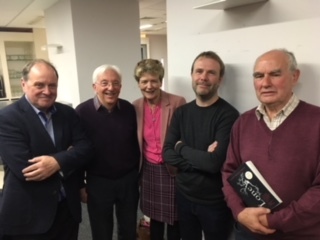 Book Club 1 were recently invited back to participate in another Radio 4 James Naughtie Bookclub programme (see photo), talking to the author Andrew Hurley about his Costa Award novel “The Loney”. The programme was recorded at Liverpool University, and went on air on Sunday 4th November at 4pm (Radio 4, Bookclub). The latest letter from the Chairman to all members can be accessed via the link below. It gives notice of the AGM on Friday 18th January 2019. Backgammon Social Group: This group meets every other Thursday at Eccles Gateway. New members are welcome. The convenor is John Lambert tel: 0161 281 9265 – email: beseeingyou7@icloud.com . Details are displayed on their web page. Similarly the following groups are also looking for new members, so why not give these a try: Discussion (every third Tuesday) Discussion; Painting and Sketch (Alternate Mondays) Paint and Sketch; Handicrafts (second Thursday of month) Handicraft ; Gardening (last Tuesday of month) Gardening; and Table Tennis (alternate Tuesdays)Table TennisGroups. More information on each can be found using these links.